September is whizzing by so fast – we’re nearing the end of Get Out The Bonzai! month. And honestly that suits me just fine. I’ve always been better at giving than asking, and I do feel bad about all these ‘admin’-type posts. I’m looking forward to my regular schedule of ‘content//content//pretty pictures//more content!’ But I do have to admit, it’s a relief to finally address these issues, fix these bugs, and get this business taken care of. Clears the way for creativity! Week one I asked you to follow @BonzaiAphrodite on Twitter. And the second week I asked that you join BA on Facebook. Then last week I requested a duet – a link on your personal blog and an add to your RSS feed. Thank you all so much for what you’ve done so far. It’s been great, and I can’t even tell you how much it means to me! Thus far our mini missions have been focused on internet interactions – both in social media and in other cyber arenas. But this week I’m asking for something a little bit more personal – and a lot more important. See, a site like mine depends completely on word-of-mouth. People hear from the people they trust and that’s how community grows. It’s powerful. So this week, I’m asking you to tell someone in your real life and Bonzai Aphrodite. It could be an email sent to a few close friends, a conversation with your favorite barista, a link you send to your veg-curious cousin. Just find a way to talk about BA and why you love it here. And if you do love it here, remember that this is the best thing you can do for the site! And I appreciate it so much! I suspect most of us have been doing that already. ;) But something tells me that when I spend a couple of hours heretomorrow, I’ll find a way to work BA into the conversation. P.S. I’m so grateful for your post on vegan tattoos, getting ready to go under the needle and your info is much appreciated. Yes, I already got the T-shirt for this one. You were pregnant about the same time as my daughter, so I turned her on to the blog during the diaper discussion. I don’t get a ton of traffic on my blog, but I have shared a link to your site a couple of times now. I’m more than happy to help spread the word! 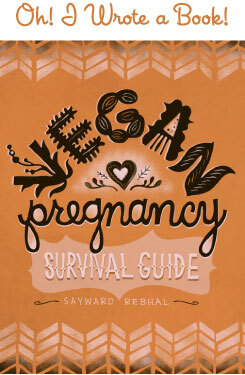 @ windycityvegan – I know, you all are way ahead of the game! And omg, that salon looks a-mazing. What/when are you getting tattooed??! @ Maureen Thompson – Yay, thank you! @ Squiggle – Ooh, thank you!!! @ Katie – Thanks lady, on all counts! @Sayward – My brother (an amazing tattoo artist, in my totally subjective, biased sisterly opinion) is designing a tattoo for me, I’ll get it when I go back to Chicago in a few weeks. It’s going to be on my left hip/torso, kind of hard to describe but there was a photo of someone with one just like it in last month’s Yoga Journal. I’m also getting a second tattoo, probably during the same visit, on either the nape of my neck or behind my ear. I’ve been meaning to get my nose pierced for about 20 years now, maybe I’ll get around to that in a few months, who knows!